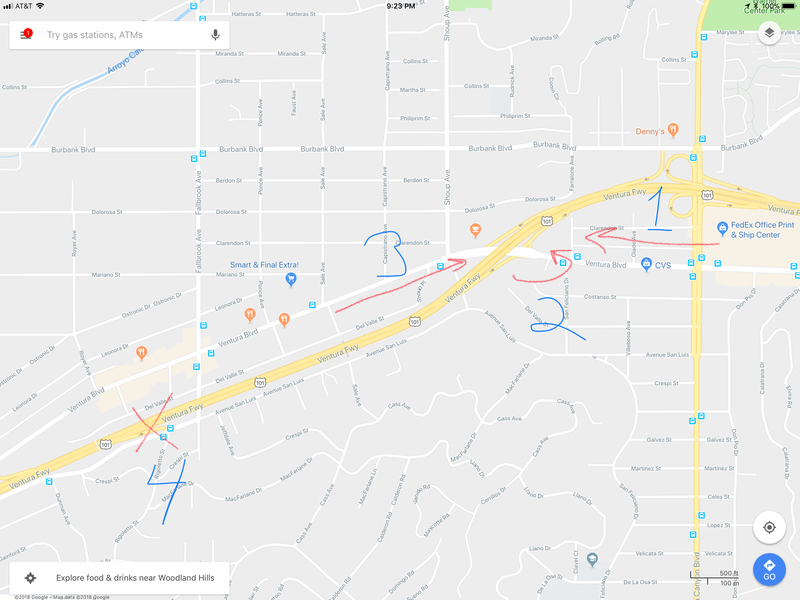 So You Want To Drive In LA? Seeing one brain-dead moron with a fancy car and an attitude that screams “Traffic rules are for peons like you!” is not unusual. They might be doing something like doing an illegal U-turn on a curve with a restricted view across a double-double yellow lined median and three lanes of heavy oncoming traffic and a huge “NO U-TURNS!” sign. Map from Google – scribbling from Paul. One – I was on Ventura Boulevard, headed west. As you can see, this is right where it crosses under the 101 Freeway. We sailed past Topanga Canyon Boulevard without a problem. Two – The brain-dead morons doing illegal U-turns on a curve with a restricted view across a double-double yellow lined median and three lanes of heavy oncoming traffic and a huge “NO U-TURNS!” sign were right where you go into the curve and under the freeway. The guy in front of me slammed on his brakes to avoid hitting one of them, I managed to stop without hitting him. With the first moron “blocking,” the next two guys just decided to go! go! go! and follow, figuring (correctly) that we wouldn’t just slam into them out of spite. (It was touch and go.) They cut across traffic and get onto that onramp onto the eastbound 101. Why didn’t they just take the normal onramp that’s like 50 yards behind them? Why are there so many of them? Why did that helicopter just tear over our heads heading westbound over the freeway at about 500 feet? Three – When we get going again I see that there are probably six or seven more cars lined up behind them, all waiting to make the same illegal U-turn back onto the onramp. Is the onramp lane closed? No, it’s full. It’s full all the way back beyond Sale, over a half mile, with other people trying to cut into that lane. You NEVER see this many people backed up at this onramp, even at the height of rush hour. And it’s not rush hour. In this day and age, there is a second thought that pops up at this point. All of these folks are doing their very best to go east, almost recklessly. You’re going west. What are they trying to get away from that I’m driving straight toward? But I don’t see any lights or emergency vehicles up ahead (yet) and I’ve always wanted to see a Kaiju eat Woodland Hills, so I press on. There’s more near gridlock at Shoup & Ventura, a hundred yards west, as even more cars are trying to turn north on Shoup, enough so that Shoup is clogged and they’re partially blocking the intersection. But I get past that just as a second helicopter tears by overhead, and I have a view up to my left at the freeway and I see that it looks like one of those helicopters might be landing on the freeway. Four – The pieces fall into place. Big accident on the 101? Probably eastbound between Woodlake and Topanga? Freeway closed? But those who know the area have gotten off on Ventura Boulevard which is running roughly parallel to the freeway. Now that they’re past the accident, they need to get back onto the freeway. But that onramp isn’t designed to deal with that sort of load, so it’s backed up and gridlocked. This in turn causes the brain-dead morons to bypass the line and do the illegal U-turn thing. What are they trying to get away from? Losing fifteen or twenty minutes and being late from dinner. That’s why they’re risking their lives, my lives, other people’s lives. The moral to the story: In Los Angeles, even if you only have a ten-minute, six-mile commute to work on the surface streets, check the traffic before you get in the car. Something might be up that will turn it into a thirty-five minute trip with a possibility of death and/or dismemberment! I play BBall with an auto body shop owner. He classifies drivers in 2 categories – good drivers and good customers! !